Android devices are equipped with hardware input devices such as microphone, camera etc, from which we can capture audio or video in our applications. The most common class that is used is MediaRecorder, which records audio and video. 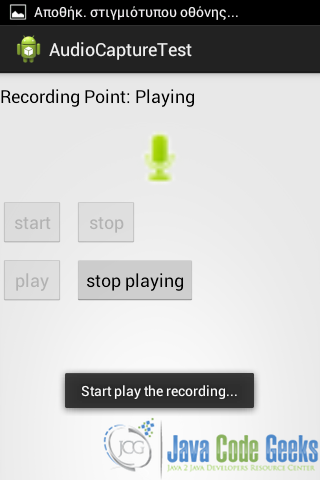 In this example, we are going to capture audio from the device’s microphone, store it to the device and then play it back and/or stop playing it. Specify the name of the application, the project and the package. Also, set 10 API or larger as the minimum Required SDK, in order to support the classes we are going to use. Then press Next button. 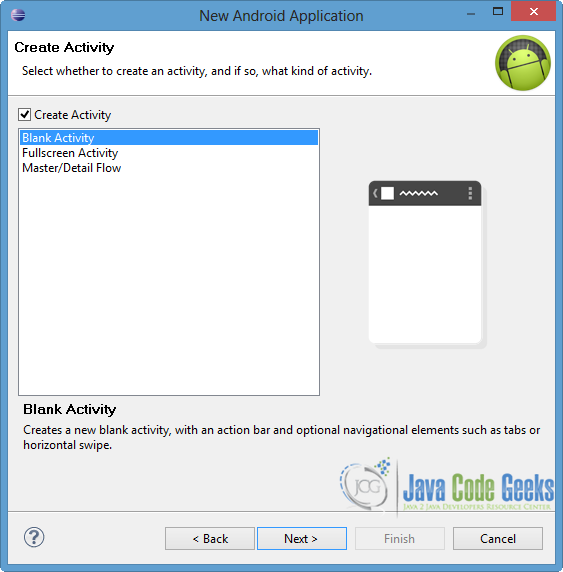 In the next window, the “Create Activity” option should be checked. The new created activity will be the main activity of your project. Then click Next. You have to specify a name for the new Activity and a name for the layout description of your app. 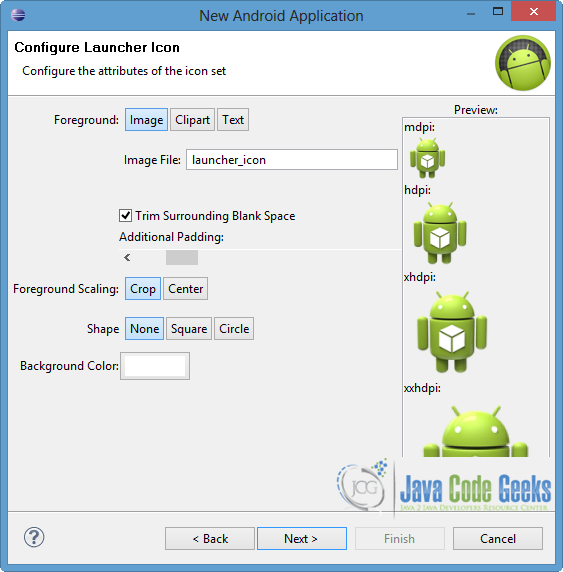 The .xml file for the layout will automatically be created in the res/layout folder. Finally, press Finish. You can see the final structure of the created project in the image below. 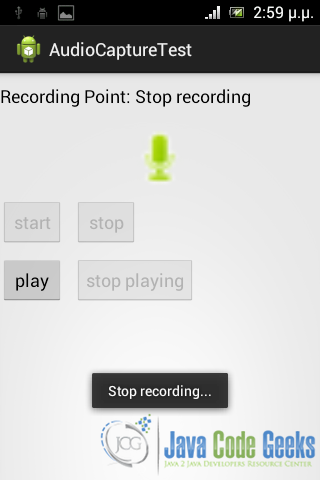 In this application, we want to start and stop recording, as well as start and stop playing the recording sound. For this reason we are going to add four different Buttons in the layout, where each one enables the appropriate functionality. Also, a TextView will be used to show us the current situation. Open res/layout/activity_main.xml go to the xml tab and paste the following. 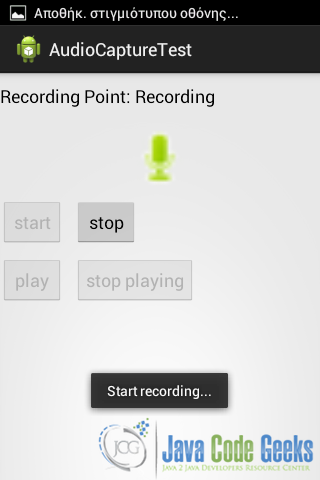 Notice that we added an ImageView where it’s content is a picture of audio recording, that Android provide us through the drawable. For audio record, we should create an instance of MediaRecorder class and set some information about the source and the output file. We use MediaRecorder.AudioSource.MIC in order to set the microphone of the device as the audio source. In addition, we have to set the format and the name of the output file, as well as the audio encoder for the output file in order to contain an audio track. Notice that in our example, we also set the path that the output file will be located. Before starting the recording is very important to prepare capturing and encoding data. For this reason, prepare() and start() methods are called. It is important to mention that prepare() method must be called before start() method, but after the setting of source, format and encoding information. 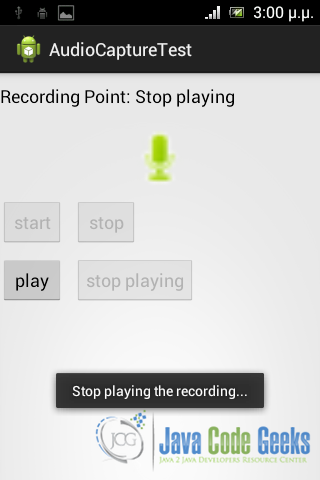 In contrast, to stop sound recording stop() method should be called. After that, if the instance of MediaRecorder is not used any more, it is recommended to free the resource, by calling release() method. If you notice in the code below, appropriate Exceptions are called for the specific methods. In our example, we want to playback the sound we just recorded, so we create an instance of MediaPlayer class. After specifying the source file that we want to use, prepare() and start() methods are called in order to start playing the audio track. Respectively, stop() and release() methods are called to stop the playback and to free the MediaPlayer object resources. 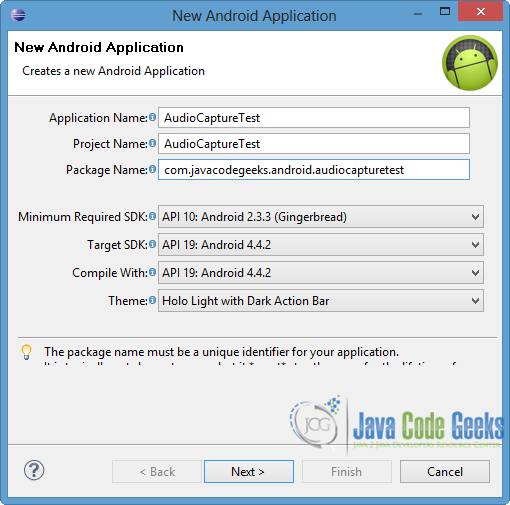 Open src/com.javacodegeeks.android.audiocapturetest/MaainActivity.java file and paste the code below. 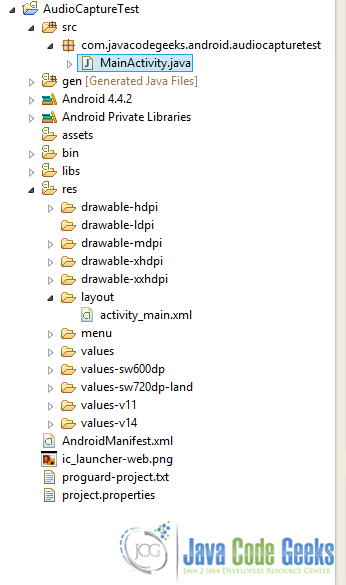 We have to declare the permissions in the AndroidManifest.xml file of our project. WRITE_EXTERNAL_STORAGE is to write the output file into the external storage of our device (sd card). RECORD_AUDIO is necessary for MediaRecorder class to capture audio. Open AndroidManifest.xml file and paste the following code. 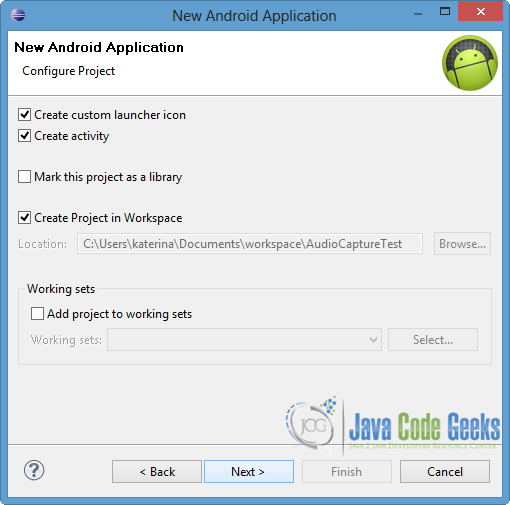 In this example, we can’t use the android emulator to run our application, because is hasn’t the ability to capture audio. 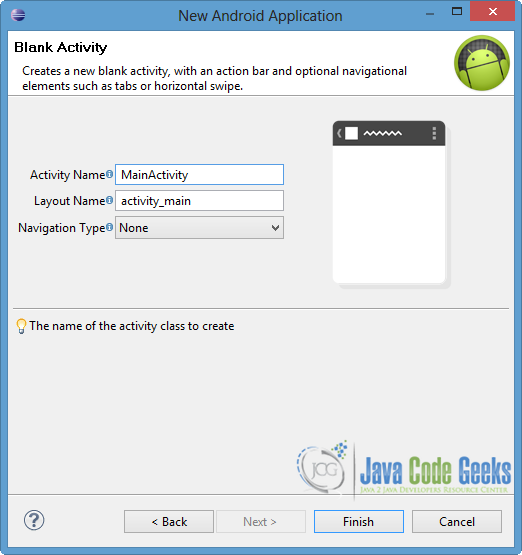 For this reason we have to connect Eclipse with our Android device and run the application through it. So, connect your Android device with your pc through USB. 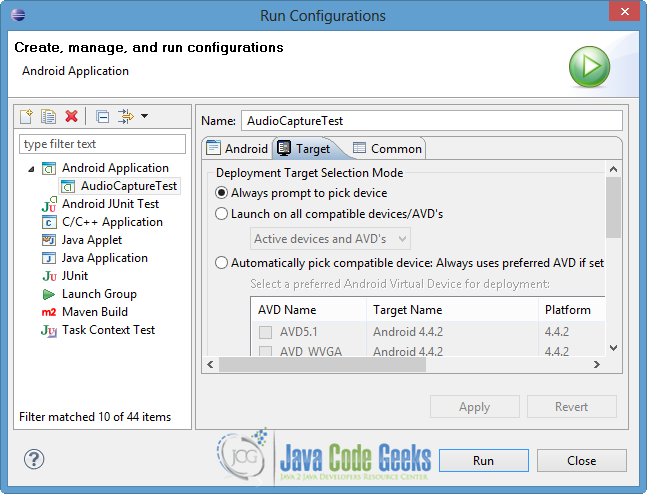 Don’t forget to enable USB debugging option, by following Settings → Applications → Development path. Then go to Eclipse, right click on our project → Run as → Run Configurations. 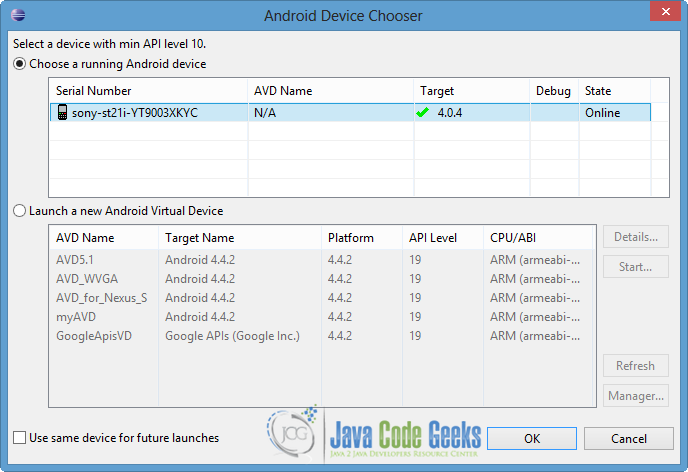 In the popup window choose the current project, go to the Target tab and choose “Always prompt to pick device” option. Then click Next. Finally choose the running Android device and press OK, as shown in the next picture. The app will be loaded in your Android device, as you can see in the image below. 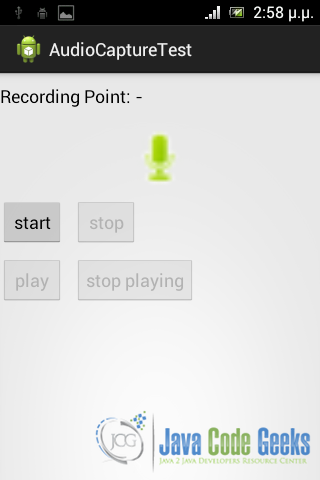 Lets press “start” button in order to start audio recording. As you can see in the picture below, a Toast appears and the TextView is set to “Recording”. Now click “stop” button. The audio track will automatically be stored into your external card. Notice that “stop” button is not clickable any more. If you want to listen to the audio you just recorded, press “play” button. The TextView will change again and a Toast message will be enabled. Finally, press “stop playing” button before the audio track ends. This move, will stop the audio and will enable “play” button again, in order to listen to it again. Very nice and clean article.